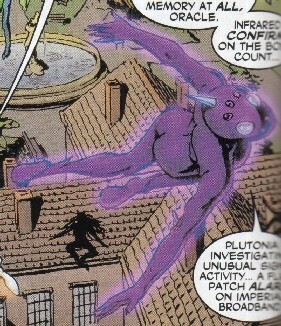 formerly Xavier Institute, Salem Centre, New York State, U.S.A.
Powers/Abilities: Plutonia was covered in purple and had phasing abilities. She had enhanced strength and senses, and could fly. Plutonia's external appearance altered slightly to match her (combat) readiness, with electric blue "eyes" and spikes indicating the highest form. She had a floating spike at the top of her head, plus floating spikes above her shoulders, but the shoulder spikes were dependent on higher combat status. She also had mind armour to protect her against Phoenix. Plutonia seemed to also have some sort of close connection with Smasher, but whether he was friend, lover or family has not been specified. History: (New X-Men I#124 - BTS) - The Shi'ar Empress, Lilandra, her mind controlled by the villainous Cassandra Nova, who inhabited Charles Xavier's body, arrived in lower Earth orbit with a team of Superguardians, including Plutonia, under the leadership of Gladiator. Cassandra Nova used Lilandra to enforce the power of the Imperial Superguardian Elite to attack the X-Men, using a lie that the mutants were infected and had to be exterminated. However, Smasher had escaped knowing the truth. (New X-Men I#124) - Several meters in the air, Plutonia patrolled the Mansion gardens alongside fellow Superguardians, Arc, Manta, Neosaurus and Oracle, seeking mutants. Plutonia then identified a Flight Patch alarm on Shi'ar Imperial frequency and flew away to investigate. (New X-Men I#124 - BTS) - Plutonia found the severely injured form of Smasher and rushed back to the other Superguardians, holding him in her arms, so that he could relate his story to the others. (New X-Men I#124) - Gladiator and Cosmo were about to attack the School's mutants inside the School vaults, but stopped once they saw Plutonia walk in holding the badly injured Smasher, who related the truth. Hearing Smasher's account, Gladiator halted the Superguardians' attack on the X-Men. (New X-Men I#125) - Gladiator assembled the remaining Superguardians, including Smasher, Plutonia, Manta and Cosmo, against the threat of Cassandra Nova. Despite activating their mind armour, the five Superguardians fell quickly before Cassandra Nova, with Plutonia phasing into Smasher, thereby disabling him. (New X-Men I#126) - Cassandra Nova, nestled inside Professor X's body, walked past the defeated Superguardians to confront the X-Men, with Smasher in continued agony as Plutonia stood phased inside his body, her facial lights dimming. (New X-Men I#133 - BTS) - Plutonia left Earth space along with the rest of Lilandra's Superguardians bound for Shi'ar space after the increasing and repeated manifestation of the Phoenix force in Jean Grey. (Uncanny X-Men#477 - BTS) - The Imperial Guard was dispatched to defeat Vulcan, who’d been destroying ships in Shi’ar space. (Uncanny X-Men I#480) - The Guard finally defeated Vulcan (keeping him alive at the orders of K’tor) after a deadly battle which left some Guard members, including Cosmo, Impulse, Smasher, and Titan, seemingly slain. Scintilla was furious about Vulcan being allowed to live. Guard members in this mission: Astra, Cosmo, Electron, Gladiator, Hobgoblin, Impulse, Manta, Mentor, Neutron, Nightside, Oracle, Plutonia, Scintilla, Smasher, Starbolt, and Titan. 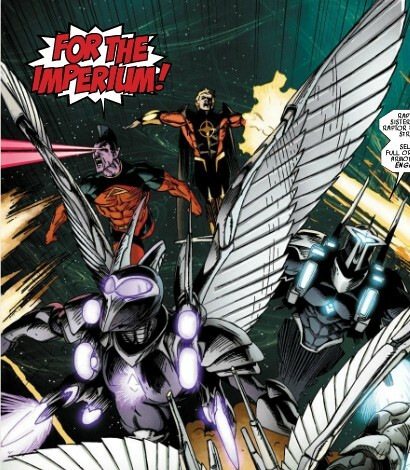 (X-Men: Emperor Vulcan#4) - During the war of the Shi'ar with the Scy'ar Tal, Electron led a force of the Imperial Guard (Manta, Plutonia, Flashfire) against the Starjammers (Ch'od, Korvus, Marvel Girl (Rachel Grey), Polaris, Raza). (X-Men: Emperor Vulcan#5) - Electron's group attacked the Starjammers and Plutonia phased her hand through Raza twice, defeating him. The Starjammers managed to defeat Electron and his allies, but Deathbird lead the rest of the Imperial Guard and defeated the Starjammers, then teleported back to save Vulcan from Havok. Days later, the Imperial Guard (Electron, Flashfire, Gladiator, Manta, Mentor, Nightside, Oracle, Plutonia, Scintilla, Titan, Warstar) stood by Deathbird, Araki, and Ka'ardum as the Shi'ar cheered on Vulcan. The Starjammers (Ch'od, Havok, Polaris, Raza) lay captive. (X-Men: Kingbreaker#3) - Vulcan ordered the Imperial Guard to intervene in a battle between the Starjammers (Ch'od, Havok, Lilandra, Marvel Girl, Korvus, Polaris, Raza) and new Guard members Hodinn, Pn'zo, Strontian, the Symbiote, and the Uncreated. Guard members present: Electron, Flashfire, Gladiator, Manta, Mentor, Nightside, Oracle, Plutonia, Scintilla, Starbolt, Titan, and Warstar. (X-Men: Kingbreaker#4) - Joined by Smasher (Salac Tuur), the Guard fought off the Starjammers, who eventually escaped after putting Deathbird into a coma. During the battle, the Hodinn and Pn'zo were killed. Later, Vulcan authorized the Imperial Guard to join the military in expanding the Shi'ar empire. (War of Kings#1) - Vulcan surveyed, with Gladiator, the assembled Imperial Guard, taking special notice of Neutron, Plutonia, Manta, the new Smasher, Squorm, and Starbolt. Mentor reported they were all battle ready and Vulcan announced his intentions to attack the Kree. They soon engaged in a massive battle with the Inhumans and Starjammers, successfully capturing Lilandra before retreating. Members of the Guard in this mission: Astra, Black Light, Earthquake, Electron, Fang, Flashfire, Gladiator, Hussar, Impulse, Magique, Manta, Mentor, Neutron, Nightside, Plutonia, Schism, Scintilla, Shapeshifter, Smasher, Squorm, Starbolt, Titan, Voyager, Warstar, and White Noise. (War of Kings#3) - Ka'ardum, with Gladiator's help, narrowly convinced Vulcan not to make Lilandra a martyr, but to hold a trial for her instead. Electron, Plutonia, and the new Smasher stood by with Gladiator while Lilandra was transported. Havok, firing a major blast against Gladiator, attacked along with Polaris, Korvus, Marvel Girl, and Groot, Drax, Rocket Raccoon, and Major Victory of the Guardians of the Galaxy. Using a bluff and a telepathic attack, Rocket and Marvel Girl held Gladiator down while Electron held off Korvus by charging his sword, though Groot then defeated Korvus with a blow. Plutonia phased through Major Victory, but the coldness in his suit disarmed her. Smasher accessed hyper-speed from his exo-specs, but Drax easily beat him unconscious. Gladiator woke up from the ruse and nearly defeated the Starjammers and the Guardians before Lilandra convinced him to join her side. He killed Smasher and announced his new allegiance. (War of Kings: Who Will Rule?#1) - Under Mentor's lead several Imperial Guard members (Astra, Black Light, Earthquake, Fang, Hussar, Impulse, Neosaurus, Neutron, Plutonia, Schism, Smasher, Squorm, Starbolt, Titan, Warstar) attended Lilandra's funeral. In front of the Inhuman Royal Family Mentor declared the Imperial Guard rulers of the Shi'ar Empire. Medusa attacked Mentor and Smasher, causing a big brawl between the Inhumans and the Imperial Guard. Gladiator hit the ground with a devastating punch, knocking out everyone around him, and asked everyone present to show some resepect for Lilandra. Crystal then gave Gladiator the sceptre and asked him to rule the Shi'ar Empire. The Imperial Guard bowed before him, accepting his rule. (Realm of Kings: Imperial Guard#1) - When the planet of Izumbard refused to create more warships for the Shi'ar, the Imperial Guard (Earthquake, Electron, Flashfire, Neutron, Plutonia, Titan, Voltar, Warstar) were sent to quell the riots. During the following battle, Plutonia and Voltar attacked the commander. Voltar speared the commander through the middle, but was killed in the ensuing explosion. During the ensuing battle, Voltar was killed. Another branch of the Guard (Commando, Fang, Gladiator, Hussar, Manta, Starbolt) soon arrived to aid in the battle. Later, at their barracks, they proposed a toast, and Manta recognized the loss of Voltar. Soon a fight broke out and Plutonia was about to get involved when Mentor, Smasher, and Oracle interrupted the fight. Mentor told them that they'd just volunteered for a special strike force mission due to their bad behavior. The next day, they learned they'd be going for recon into the Fault, the rip in time and space, alongside Ch'od and Raza of the Starjammers. (Realm of Kings: Imperial Guard#2) - After being briefed by Gladiator, the Imperial Guard (Fang, Flashfire, Hussar, Manta, Mentor, Neutron, Oracle, Plutonia, Smasher, Starbolt, Warstar) were sent into the Fault to investigate, with Ch'od and Raza among them. The ship was soon under attack by energy leeches and the crew struggled to stay in the air. When one breached the ship, Mentor ordered Warstar not to fire on it, but to instead trap it in a force field, in which the creature fed upon itself. Mentor recommended the ship run on silent so as not to attract more leeches, and Ch'od reluctantly agreed. Within minutes, a giant ship approached, and they prepared the Starjammer for battle. The ship, bio-organic in nature, fired on them, and then caught them in a tractor beam, pulling it inside. As they battled off biological monsters, Oracle surmised they were aboard a rotting corpse that was seeking to use its enzymes to kill them. (Realm of Kings: Imperial Guard#3) - Over the following six hours, as the dead ship grew around the Starjammer, the Guard worked to repair their ship. Oracle soon discovered the ship had been killed while running from something else. As enzymes attacked them, they realized they need to rush away before they were digested, and they narrowly escaped. They soon came across a massive field of debris. They followed an energy signature, hoping to find Vulcan, when Warstar and Neutron were hit by a massive energy burst. When the air cleared, they saw Quasar (Wendell Vaughn) there, with a massive biological entity pursuing him. (Realm of Kings: Imperial Guard#4) - Oracle managed to send a telepathic call for help through Quasar's quantum powers into the M'Kraan Crystal, reaching Gladiator. The Guard hid themselves in the debris zone and worked to lay mines on the surrounding debris. Many of the members shared a final toast before the alien beings arrived aboard their massive ship and began moving through the mines. On the ship, worried for his health, Plutonia brought Mentor a nutrient drink and tried to confess her feelings for him, but he ignored her, too distracted by their mission, and she rushed off. Ch'od soon let Mentor know that someone had sabotaged the ship's hyperdrive capacitor, and Mentor soon realized it was Smasher. When Smasher returned, Oracle tried reading his thoughts and realized she couldn't. Plutonia soon took two amulets out of Smasher's hands and he furiously attacked Ch'od and Raza, demanding the amulets. He explained that he was one of the Fraternity of Raptors, not the one who assassinated Lilandra (that was Darkhawk, an earthling) and that his race had been involved in setting up the Shi'ar Empire for thousands of years. He said that he could give them major firepower for the coming battle if they let him have the amulets back. Outside the xenoform beings attacked in the form of the X-Men and Starbolt was quickly killed in battle. Gladiator then arrived to aid them. (Realm of Kings: Imperial Guard#5 (fb)) - Gladiator had more of the Guard (Arc, Black Light, Commando, Electron, G- Type, Moondancer, Titan, Voyager, White Noise) assembled at his order, to rescue the stranded team (Fang, Flashfire, Hussar, Manta, Mentor, Neutron, Oracle, Plutonia, Warstar), with Ch'od, Raza, Talon (previously thought to be Smasher), and Quasar, from within the Fault. Voyager, with great strain, opened a gateway to within the Fault, then stayed behind while Moondancer used her powers to guide them through the debris and to the ship, which was surrounded by bizarre and deadly xenoform beings patterned after the X-Men. (Realm of Kings: Imperial Guard#5) - The two sides of the Guard savagely attacked the aliens, killing them swiftly and decisively. Gladiator rushed into the ship and, smoking from the battle, demanded that Mentor give a full report, hearing that "an abominable universe of reciprocal otherness" existed on the far side of the Fault, full of cancerous aggression and new physical laws. Gladiator saw Plutonia, Ch'od, Raza, Quasar, and Talon standing by, and he threatened Talon's life for Lilandra's death, but Talon assured him another Raptor had killed Lilandra and that, if he was given back the amulets and if he had two volunteers, he would create two new Raptors to aid in the fight. Mentor surprised them all by volunteering, and Plutonia agreed to as well, hearing Mentor profess how proud he'd be to serve with her. They were soon transformed into Kyte (Plutonia) and Strel (Mentor) and joined the fight. During the battle, Black Light and Neutron were killed. The combined Guard narrowly escaped a savage telepathic attack when Ch'od and Raza launched the Symbiote (formerly of the Praetorians) at the Xavier being the attack had originated from. After they successfully escaped, Gladiator reported their success to the Inhumans, and announced the pending war with the Fault universe. A new Plutonia was appointed later. (Wolverine and the X-Men Annual#1) - At the Imperial Guard training school, Kid Gladiator provided his report to the others about his time on Earth. In earshot were Titan, Warstar, the Manta trainees, the Fang trainees, and the Smasher trainees, including Subguardian Smasher-7. Other trainees included those seeking to become Starbolt, Oracle, Plutonia, Neutron, Flashfire, Hussar, Electron, and others, but Kid Gladiator was the only one in his program. Against his father's orders, he joined the Smasher trainees (including numbers 10, 11, and 12), the Avengers, and the Imperial Guard (including Monstra and Arc). (Guardians of the Galaxy III#12) - The Imperial Guard (Manta, Electron, Titan, Flashfire, Warstar, Smasher, Plutonia, Oracle) trained on Chandilar, then prepared to stand guard at the trial of Jean Grey. (All-New X-Men I#24) - The Imperial Guard (Oracle, Warstar, Impulse, Mentor, Manta, Hussar, Flashfire, Plutonia, Smasher, Astra, Electron, Titan, Scintilla) stood by at the trial, debating among themselves the guilt of Jean Grey, who pushed her powers to the limits and briefly defeated the entire team. When the X-Men, the Guardians of the Galaxy, and the Starjammers arrived, they fought the Guard. (Thanos II#2) – The Imperial Guard (Flashfire, Smasher (Izzy Kane), Starbolt, Fang, Impulse) showed up on the Shi’ar planet, Nulla, to arrest Thanos. (Thanos II#3) – On Nulla, the Imperial Guard (Flashfire, Starbolt, Fang, Smasher (Izzy Kane), Impulse, Neutron, Plutonia, Manta, Hardball, Hobgoblin, Nightside, Oracle, Titan, Gladiator) savagely attacked Thanos, with more members backing them up. Though Thanos fought hard, they soon realized he was bleeding and wounded, and Gladiator delivered the final blow. Thanos was apprehended. (Thanos II#5) – The Imperial Guard (Impulse, Hardball, Smasher (Izzy Kane), Nightside, Manta, Titan, Fang, Neutron, Hobgoblin) delivered Thanos to a secure Shi’ar prison, where Warden Daak saw his safe imprisonment. (Mighty Thor II#17) - Gladiator (and Kid Gladiator) led the Imperial Guard (Astra, Plutonia, Hobgoblin, Starbolt, Oracle, Manta, Neutron, Fang, Electron, Warstar, Webwing, Hussar, Smasher (Isabel Kane)) against the Asgardians, but the Destroyer was unleashed to fight them back. (Mighty Thor II#18 - BTS) - Gladiator kept the Imperial Guard off to the side during the battle between gods. Comments: Created by Grant Morrison (writer) and Igor Kordey (artist). Her real name was revealed in Realm of Kings: Imperial Guard#5. After the previous Plutonia adopted the identity of Kyte, the newly appointed Plutonia joined the Imperial Guard on the planet Elysialla VII (the mausoleum world of the Guard), to mourn the fallen Imperial Guard members.